Indian Tamil Hindu women hold utensils as they wait in a queue to collect water to cook special food to celebrate the harvest festival of Pongal at Dharavi, one of the world's largest slums, in Mumbai, India, Jan. 15, 2019. This week saw chaos and devastation in many places. These are the most powerful images of the week. This week saw violence, protest, and disruption around the world. Progress toward the Global Goals, including peace and equality for all, is more necessary now than ever before. You can take action here to join them and call for action on these issues. People around the world witnessed turmoil and devastation this week. As the government shutdown in the United States enters its fourth week, furloughed federal employees are feeling the strain. Without pay checks, many are having difficulty purchasing food to feed their families and keeping a roof over their heads, but chef José Andrés and several other restaurants and organizations are stepping to lend support. In addition to the 800,000 federal employees affected by the shutdown, millions of Americans will also soon be affected as social benefit programs are not fully funded for the year. But the shutdown wasn't the only cause of chaos in the US this week. 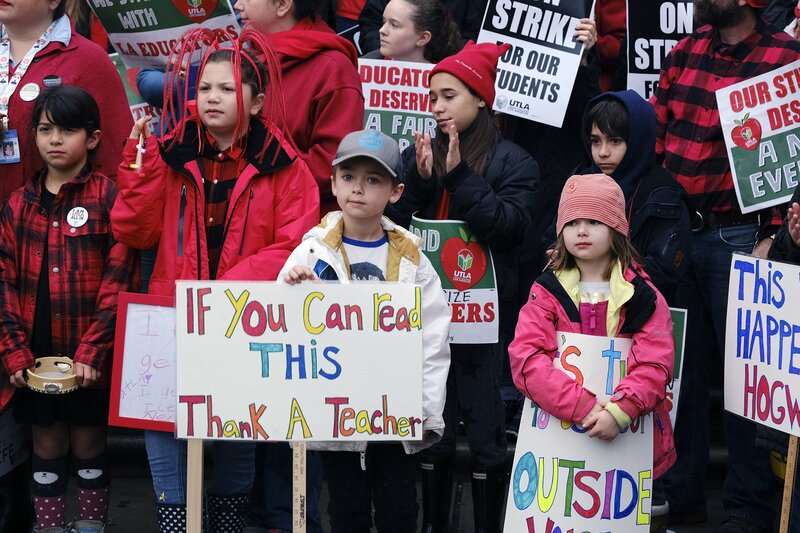 In Los Angeles, more than 32,000 educators went on strike to protest low pay and poor classroom conditions. Elsewhere in the world violence and conflict caused fear and mourning. In Syria, the civil war, approaching its ninth year, continues. The active conflict is preventing humanitarian aid from reaching camps of displaced people and the harsh winter temperatures mixed with poor access to medical care has led to deaths of more than a dozen children. Migrants are still traveling north from Honduras, Guatemala, and El Salvador fleeing gang violence, while Kenya's capital, Nairobi, was shaken by a deadly terrorist attack on a hotel complex this week. These are some of this week's most powerful images. 1) Los Angeles Public School Strike: Elementary school students, Capri Mac, right, and her brother Sawyer, second from right, stand in support of a teachers in front of Hamilton High School during a city wide teacher strike on Wed. Jan. 16, at Hamilton High School. Los Angeles school administrators urged the union to resume bargaining as tens of thousands of teachers planned to walk picket lines for a third day Wednesday, after being joined on strike for the first time by some of their counterparts from independent charter schools. More than 32,000 Los Angeles Unified School District (LAUSD) educators walked out of school this week, marking the first time in 30 years that Los Angeles teachers are on strike. Parents marched alongside teachers in downtown Los Angeles, protesting for smaller classroom sizes, higher wages, and better school conditions in the US’ second-largest school district. The strike in LA is significant for many reasons, but since LAUSD has among the highest concentrations of low-income students in California, with more than 80% living at or below the poverty line, the extra funding could mean more help for students of color to overcome poverty. These students do not have the same resources available to them at home as those with wealthier families and need all the extra support they can get. 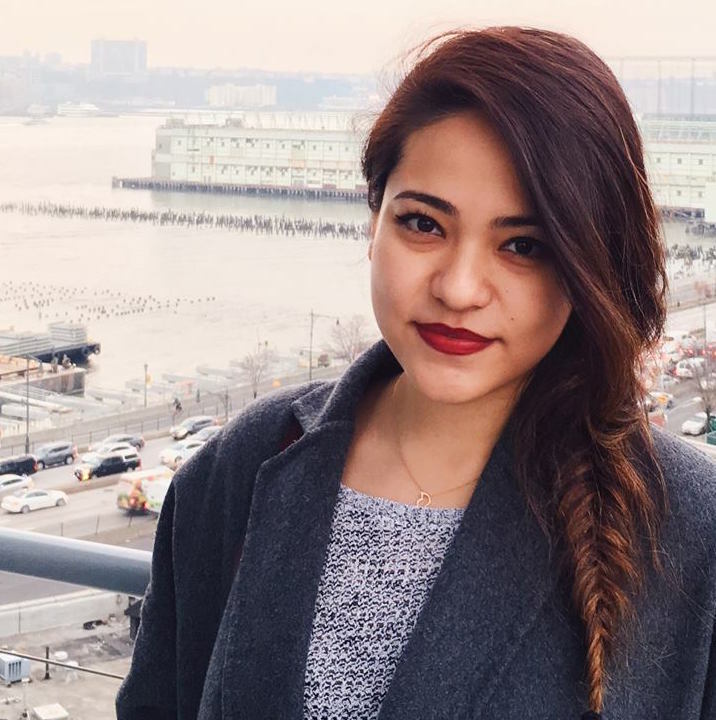 Lower-income students are much less prepared for college than higher-income classmates, which puts them at a disadvantage, as studies have shown there’s a direct correlation between completing college and financial stability. 2) Terror in Kenya: People are evacuated at the scene where explosions and gunshots were heard at the Dusit hotel compound, in Nairobi, Kenya, Jan. 15, 2019. 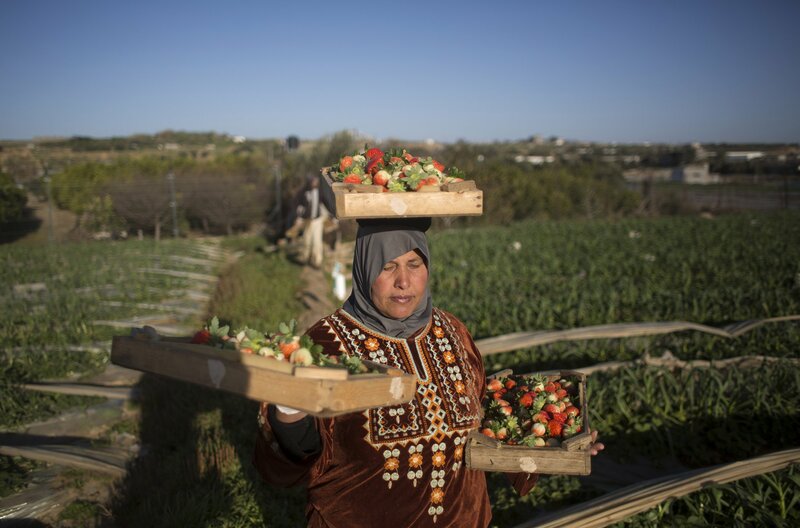 3) Economic Empowerment in Gaza: A Palestinian woman, employed by UNRWA, carries wooden trays filled with strawberries, at a farm, in the town of Beit Lahiya, Northern Gaza Strip, Jan. 15, 2019. The project, funded by the French Government aims to provide short term employment in agriculture to hundreds of poor Palestinians in Gaza Strip, where more than half the population are unemployed. 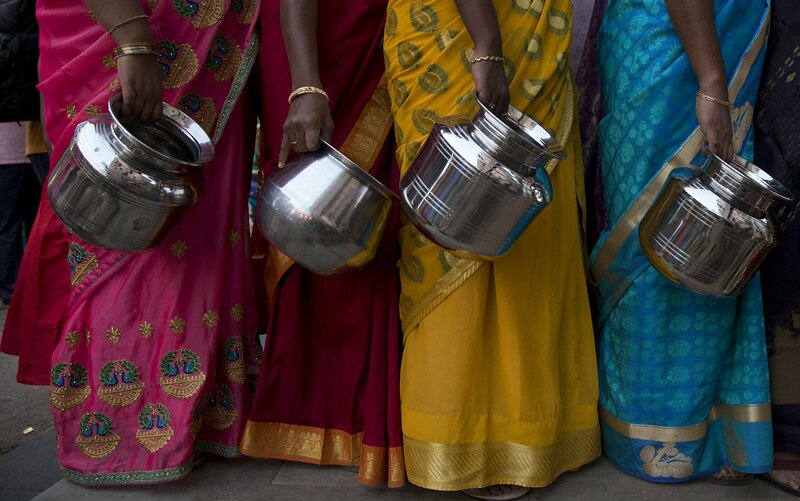 4) Water Acces in India: Indian Tamil Hindu women hold utensils as they wait in a queue to collect water to cook special food to celebrate the harvest festival of Pongal at Dharavi, one of the world's largest slums, in Mumbai, India, Jan. 15, 2019. This celebration, held according to the solar calendar, marks the beginning of the sun's northward movement and is considered to be auspicious. According to WaterAid, 163 million people don't have clean water in India. 5) Syrian Conflict: This picture taken on Jan. 15, 2019 shows a reflection of Syrian fighters from the Turkish-backed National Liberation Front (NLF), as they stand during a patrol in al-Zahra neighbourhood, on the northwestern outskirts of the northern city of Aleppo. Salvadoran migrants talk as they prepare to set off for the U.S. border with others in a caravan, in San Salvador, El Salvador, at dawn on Jan. 16, 2019. 6) Central American Migration: Salvadoran migrants talk as they prepare to set off for the US border with others in a caravan, in San Salvador, El Salvador, at dawn on Jan. 16, 2019. Migrants fleeing Central America's Northern Triangle region comprising Honduras, El Salvador, and Guatemala routinely cite poverty and rampant gang violence as their motivation for leaving. 7) Attack in Kenya: People react as they are reunited with family after being evacuated from the DusitD2 compound in Nairobi after a blast followed by a gun battle rocked the upmarket hotel complex on Jan. 15, 2019. Fifteen people have died in an Islamist attack on an upmarket hotel complex in Nairobi, Kenyan police sources said on Jan. 16, as fresh explosions and gunfire rang out in the siege which stretched into its second day. 8) Pollution in Pakistan: Pakistani residents sit around a wood fire alongside a road amid heavy fog and smog conditions in Lahore on Jan. 17, 2019. Smog levels spike during winter in southern Pakistan, when air quality often eclipses the World Health Organization's safe levels. Cooler air traps pollutants — such as from vehicles, building sites and farmers burning crops in regions outside the Indian capital — close to the ground. 9) Jose Andres Opens Restaurant For Furloughed Government Workers: A customer sits in a restaurant opened by chef Jose Andres for federal workers and their families during a partial government shutdown in Washington, DC, US, on Jan. 17, 2019. The shutdown is now the longest shutdown in US history. The longer the US federal government shutdown drags on, the more federal workers and contractors have been seeking help getting food for themselves and their families. 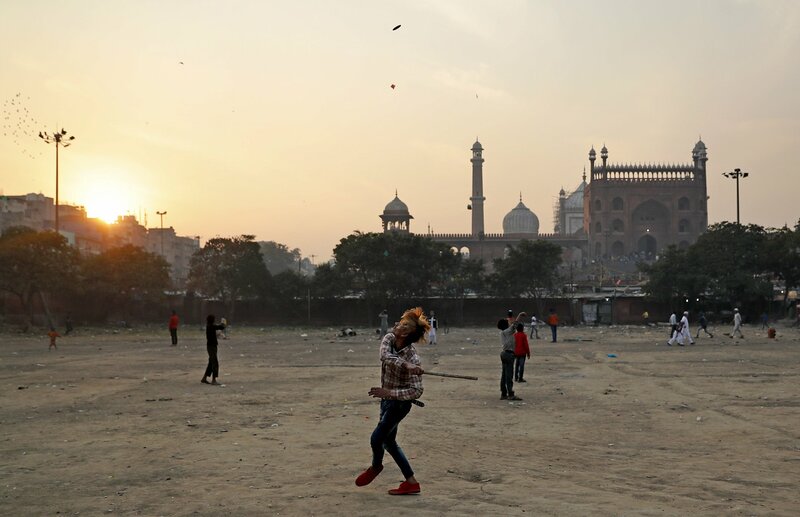 10) Daily life in India: An Indian boy plays in front of Jama Masjid mosque as the sun sets in the old parts of New Delhi, India, Jan. 16, 2019. Old Delhi, founded by Mughal Emperor Shah Jahan in the 17th Century, is today a dilapidated version of its former glory when it was the capital city of the Mughals and filled with mosques, gardens, mansions of nobles, and members of the royal court. Despite being extremely crowded and dilapidated, it still serves as the symbolic heart of the city. 11) Weather in Syria: A man paddles a small boat along a flooded street in the town of Darkush, in the west of Idlib province on Jan. 17, 2019, following heavy rains that saw the Orontes River (Assi River) break its banks and flood parts of the town and the nearby orchards. 12) Winter Weather: A Syrian man clears snow off his tent at a refugee camp in Lebanon's eastern Bekaa valley on Jan. 16, 2019. Lebanon hosts an estimated 1.5 million Syrian refugees, many of whom live in informal settlements that have little or no infrastructure. 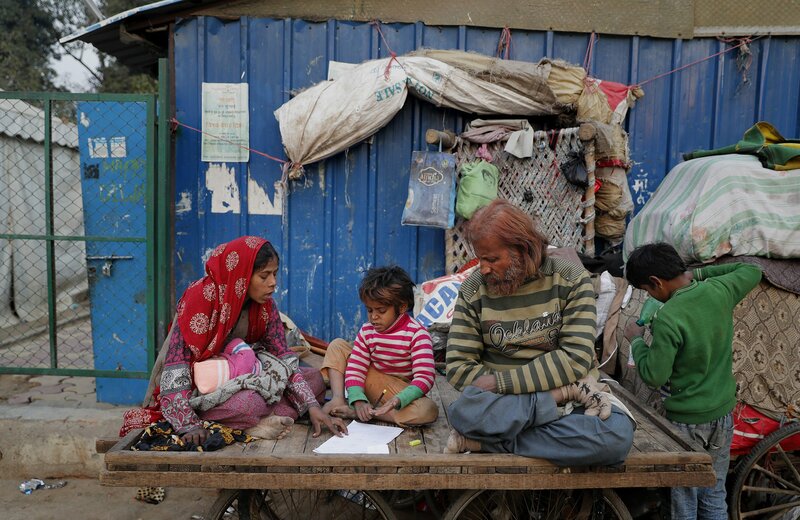 13) Poverty in India: A homeless woman helps her son Farmaan with his homework as they sit on a bicycle cart, their belongings hanging on a wall, in New Delhi, India, Wednesday, Jan. 16, 2019. Some 800 million people in the country live in poverty, many of them migrating to big cities in search of a livelihood and often ending up on the streets.